Six Gun | What's next? I like questions and Dad likes that I like them. -Sign of an inquisitive mind, Son. Fire away. So normally I do: I fire away with my Why gun until I totally destroy the target. Cowboys had six guns not because they had six guns but because their guns carried six bullets in a twisting thing called a magazine. Not that kind. With a very difficult Indian to kill they often had to reload with brilliant ammo which they wore in belts round their chests if they were Mexican cowboys, but got from nowhere or perhaps their pockets if they were just normal cowboys from places like Texas and Cornwall. It’s in the west. Sometimes I imagine my Why gun has six bullets, too, and that I’m not a Mexican. Shall I tell you some more about that? Okay I will. 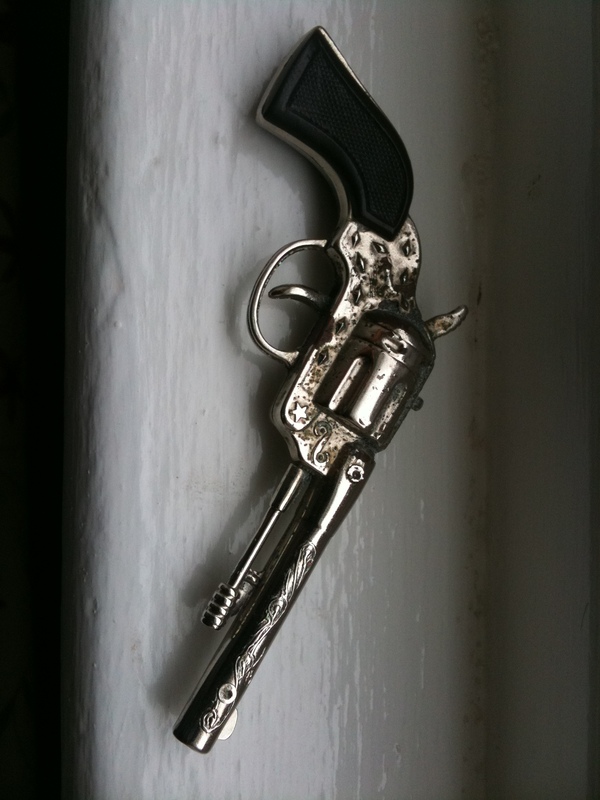 The reason is this: I hardly ever have to reload my six gun because six Whys is more than enough. For example, if I walk into the kitchen and ask what’s for supper Dad might say fish, if it’s fish, and the rest of the shootout would go like this. -Why are we having fish? -Because fish is good for you. -It’s a great source of protein and omega oils. -Because that’s what’s in it, to keep you healthy. -Wash your hands and lay the table. I only used four real Why bullets in that conversation. The fifth one was unnecessary which means pointless because I used up a Why on a question I already knew the answer to. It was fine to do that when I was three or four and an idiot, but now that I’m six Dad says it’s not. You wouldn’t shoot a dead Indian, would you?